DENSE, HARD, LOW DUST BLAST MEDIA, SUITABLE FOR USE IN BLAST CABINETS, BLAST ROOMS, AND OPEN BLASTING. 100% NATURAL, AND VERY EFFICIENT. HARDER AND HEAVIER THAN MINERAL SLAG ABRASIVES, SAND, AND CRUSHED GLASS, WHICH OFTEN RESULTS IN A SUPERIOR CLEANING RATE OF UP TO TWICE THE SQ. MTRS. PER HOUR. NB. ALL GARNET IS NOT THE SAME : WE ONLY SUPPLY ALMANDITE FULL CRYSTAL GARNETS AS THEY YIELD LOWER DUST LEVELS AND FASTER CUTTING SPEEDS THAN THE CHEAPER MORE FRIABLE FRACTURED (ANDRADITE) GARNETS. 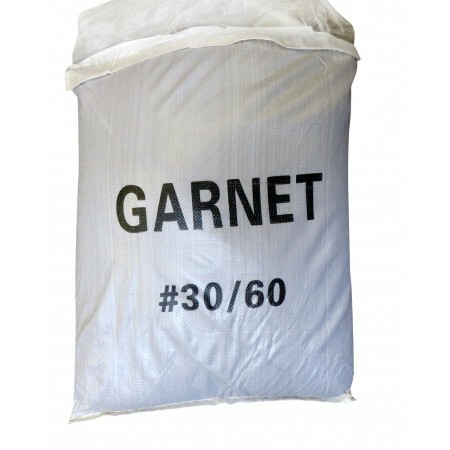 GENERAL PURPOSE, THIS IS THE MOST POPULAR GRADE, SUITABLE FOR ALL SURFACE PREP RUST AND COATING REMOVAL WORK, USE IN TANKS & CONFINED SPACES WHERE LOW DUST IS PARAMOUNT. GREAT FOR REMOVING MILL SCALE, AND FOR STAINLESS STEEL, AND SPECIAL ALLOYS. BEST USED AT LOW PRESSURE TO ACHIEVE MAXIMUM IMPACT VELOCITY & BEST CLEANING RATES .... 30 TO 40 PSI FOR DIRECT PRESSURE BLAST MACHINES. 60 TO 70 PSI FOR SUCTION BLAST MACHINES. WINDING UP THE PRESSURE WILL MERELY INCREASE FRICTIONAL HEAT & DUST. POPULAR WITH INDUSTRIAL PAINTING CONTRACTORS, SHIP & MARINE REPAIRERS, BLAST ROOMS FOR HEAVY EQUIPMENT, PETRO-CHEMICAL, OFFSHORE, FABRICATORS, AND POWDER COATERS.